Many people come from all over Japan and the world to explore the historical and cultural attractions of the ancient capital of Kyoto. However Fushimi, in the southern part of Kyoto, is not as well known as the central parts of the city north of Kyoto Station. Yet places like the Fushimi Inari or Fushimi Momoyama are becoming increasingly famous, with visitors coming here to visit the shrines, stroll through historical areas, visit sake breweries, or hike through the natural scenery. The Fushimi Inari Shrine, known fondly as O-Inari-san, is noted for its long corridors of vermilion torii gates climbing high into the rich natural environment of Mt. Inari, inviting visitors to explore and wander. Going further down south from Inari, to Momoyama, visitors can stand in the grounds on the Gokonomiya Shrine, nicknamed Gokon-san, and remember the days long past when such great warlords as Toyotomi Hideyoshi and Tokugawa Ieyasu would come here to worship. This area has also been a major sake production area, and still contains a number of sake breweries where visitors can view the breweries, taste the sake, and enjoy meals washed down with sake at restaurants. With whisky and winery tours now a standard part of international tourism, Fushimi, Kyoto, is a place where you can fully enjoy sake, Japan’s national drink. Fushimi developed as a castle town at the end of the 16th century, when Toyotomi Hideyoshi constructed Fushimi Castle, and was a town of warriors, filled with the residences of lords (daimyo) from all over the country. Its history as a sake-producing town dates back to those days. Surviving the vicissitudes of history and even the destruction of Fushimi Castle, Fushimi drew on its prime location for river and land transport to be reborn as a post town and riverside trading town, filled with travelers from all parts. As a free and vigorous city that has been both a town of warriors and a town of merchants, Fushimi has welcomed all to develop into the unpretentious, down-to-earth town it remains today. Access to the Fushimi area is easy. Just take the JR Nara Line or the Kintetsu Kyoto Line from Kyoto Station, or the Keihan Main Line from either Sanjo or Shijo stations in central Kyoto, or from Osaka City. 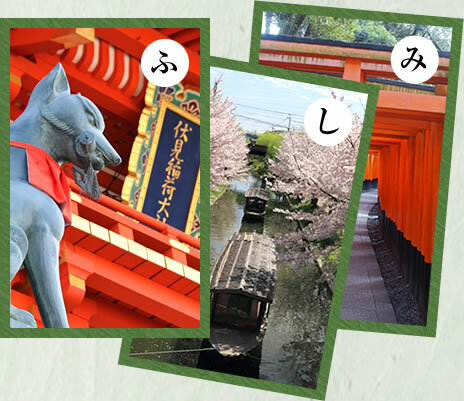 With such ease of access, why not spend a while visiting Fushimi Inari, Fushimi Momoyama, or any of the many other areas of interest here?